Thank you again to Denise for giving me the blank check to cover this episode! I'm only one episode of coverage away from the end of the book and I have to confess that I'm not at all sure where this is going. Will our little ragtag band of survivors make it to the farm? Will the religion that Lauren invented really take root? 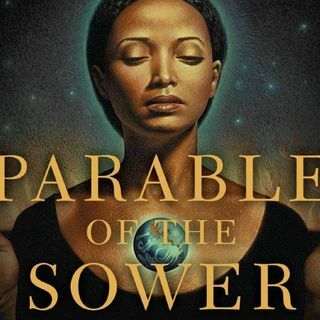 You know, it's only just occurring to me that the book is called Parable Of The Sower because Lauren is sowing Starseed, AKA her new faith. How did I not ... See More put that together before? Yet again we get some more additions to the band than I expected, but these are even more tenuous an addition than the last two. We also get more information about the wage slavery that has taken over in this world than we've seen thus far, and it's a far cry from the cushy indentured servitude that we see in, for example, Ready Player One. Frankly, it's a lot more realistic because the legality of it all is questionable and only maintained by the fact that the oppressed people have no power to question it, get defensive with lawyers, or do anything to change their situation. *sigh* What does it say about our world that I think this is something that may actually be happening in the United States at this very moment? Thanks again so much to everyone for listening, and I will see you soon (hopefully) with the finale episode!